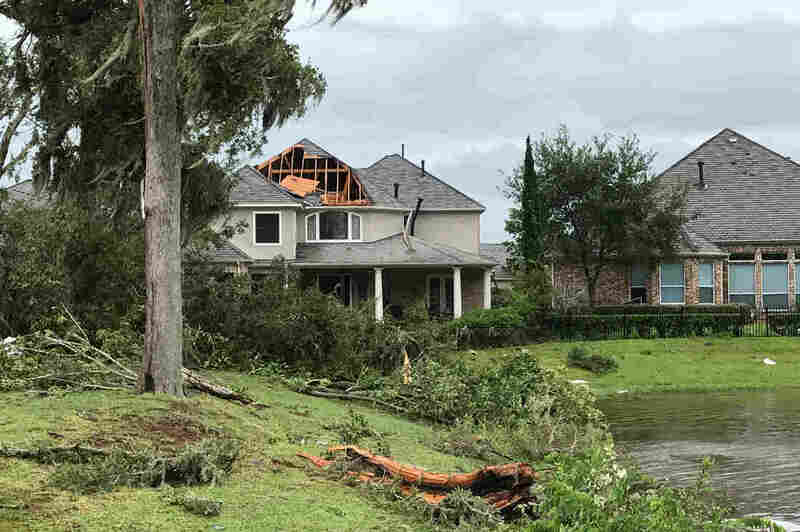 As Houston-Area Suburbs Wait For Harvey To Blow Over, Temporary Fixes Abound In wealthy Sierra Plantation, crews are working hard to patch roofs and clear debris from downed trees. But it's all just a temporary solution until the storm's cycle brings more damage. Hurricane Harvey left damaged homes in Sienna Plantation, a collection of subdivisions in Missouri City, about 20 miles south of Houston. 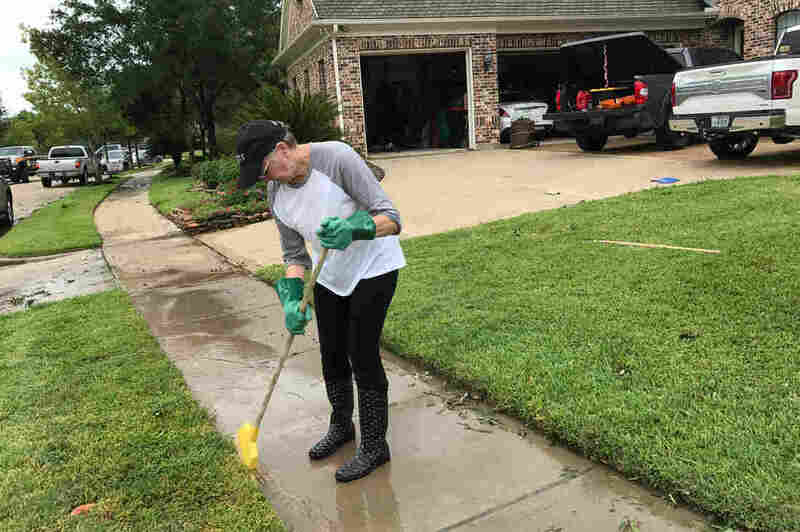 Hurricane Harvey left a lot of damage — not only along the Texas coastal towns where it made landfall Friday, but also in communities like Sienna Plantation, in Missouri City, about 20 miles south of Houston. "It's true when they tell you that it sounds like a freight train coming through," Linda Varnado says, "because that's what it is ... and it's a sound that I don't want to hear ever again." Varnado and her husband are both retired and live in a gated subdivision of the Sienna Plantation neighborhood. She says she didn't sleep at all Friday night. She heard the wind picking up dramatically around 2 a.m. Saturday. As scary as that was, she says she feels very fortunate. "Many of my neighbors can't say that today." Linda Varnado says she and her husband had anticipated a lot of rain but not strong winds. "I was not expecting this force tearing through my neighborhood." Many homes here were wrecked, with damage including ripped-off roofs and broken windows. Varnado's home has water damage and several trees are down, though she says it is "nothing major." By morning, the couple had called a roofing company to put a tarp where roof shingles had blown off. Water damage was their main concern, "water was leaking in already," she says. Now the couple is dealing with pools of water on their sidewalks and trying to remove heavy tree stumps from their front lawn. Even in this condition, it's easy to see that Sierra Plantation is a well-heeled set of subdivisions, with landscaped greenery and mowed lawns. But on Saturday, trees, broken branches, roof shingles, broken glass and other construction materials cover the area. Some children are riding their bikes, taking pictures of the destruction that Harvey left behind in their community. 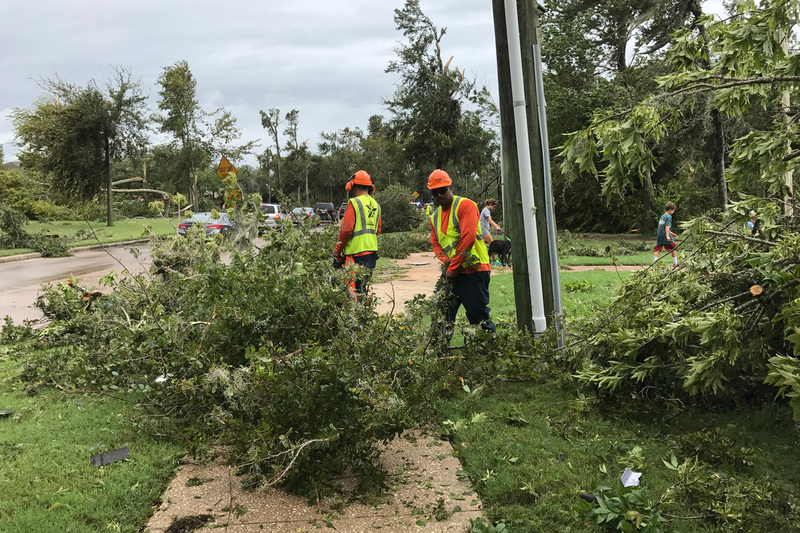 Crews are clearing debris and removing downed trees and broken branches from public areas and lawns throughout the neighborhood. Meanwhile, crews are working hard to clear debris, removing downed trees and broken branches from public areas and lawns. Roofers are nailing tarps onto roofs and making temporary fixes to blown-off patches. Emilio Perez has been surveying the neighborhood since early Saturday morning, assessing the damage. The superintendent head of Ernie Smith & Son, a Houston roofing company, he has about 20 workers here. And while his crews can't make repairs just yet, because more rain is expected, you see them perched on roofs. "Everything we are doing right now is temporary" he says, "just preventing the homes from getting more damage." Perez, who has worked in construction his entire life, was not expecting to see this level of destruction. "I knew there were some tornado warnings, but it looks pretty bad," he adds, though he was happy no one had been hurt.